Katharina von Bora (January 29, 1499 – December 20, 1552), also referred to as "die Lutherin" was the wife of Martin Luther, German leader of the Protestant Reformation. Beyond what is found in the writings of Luther and some of his contemporaries, little is known about her. Despite this, Katharina is often considered one of the most important participants of the Reformation because of her role in helping to define Protestant family life and setting the tone for clergy marriages. Katharina von Bora was daughter to a family of Saxon landed gentry. According to common belief, she was born on 29 January 1499 in Lippendorf; however, there is no evidence of this date from contemporary documents. Due to the various lineages within the family and the uncertainty about Katharina's birth name, there were and are diverging theories about her place of birth. Lately, however, a different view upon this matter has been proposed: that she was born in Hirschfeld and that her parents are supposed to have been a Hans von Bora zu Hirschfeld and his wife Anna von Haugwitz. Neither can be historically proven. It is also possible that Katharina was the daughter of a Jan von Bora auf Lippendorf and his wife Margarete, whose family name has not been established. Both were only specifically mentioned in the year 1505. It is certain that her father sent the five-year-old Katharina to the Benedictine cloister in Brehna in 1504 for education. This is documented in a letter from Laurentius Zoch to Martin Luther, written on October 30, 1531. This letter is the only evidence for Katharina von Bora's time spent within the monastery. At the age of nine she moved to the Cistercian monastery of Marienthron (Mary's Throne) in Nimbschen, near Grimma, where her maternal aunt was already a member of the community. Katharina is well documented at this monastery in a provision list of 1509/10. After several years of religious life, Katharina became interested in the growing reform movement and grew dissatisfied with her life in the monastery. Conspiring with several other nuns to flee in secrecy, she contacted Luther and begged for his assistance. On Easter Eve, 4 April 1523, Luther sent Leonhard Köppe, a city councilman of Torgau and merchant who regularly delivered herring to the monastery. The nuns successfully escaped by hiding in Köppe's covered wagon among the fish barrels, and fled to Wittenberg. A local student wrote to a friend: 'A wagon load of vestal virgins has just come to town, all more eager for marriage than for life. God grant them husbands lest worse befall." 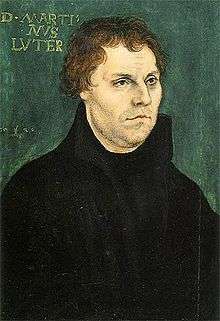 Luther at first asked the parents and relations of the refugee nuns to admit them again into their houses, but they declined to receive them, possibly as this was participating in a crime under canon law. Within two years, Luther was able to arrange homes, marriages, or employment for all of the escaped nuns—except for Katharina. She first was housed with the family of Philipp Reichenbach, the city clerk of Wittenberg, and later went to the home of Lucas Cranach the Elder and his wife, Barbara. 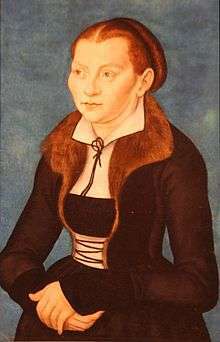 Katharina had a number of suitors, including Wittenberg University alumnus Jerome (Hieronymus) Baumgärtner (1498–1565) of Nuremberg and a pastor, Kaspar Glatz of Orlamünde, but none of the proposed matches resulted in marriage. Finally, she told Luther’s friend and fellow reformer, Nikolaus von Amsdorf, that she would be willing to marry only Luther or von Amsdorf himself. Martin Luther eventually married Katharina on June 13, 1525, before witnesses including Justus Jonas, Johannes Bugenhagen, and Barbara and Lucas Cranach the Elder. There was a wedding breakfast the next morning with a small company, but two weeks later, on June 27, they held a more formal public ceremony which was presided over by Bugenhagen. Von Bora was 26 years old, Luther 41. The couple took up residence in the "Black Cloister" (Augusteum), the former dormitory and educational institution for Augustinian friars studying in Wittenberg, given as a wedding gift by the reform-minded John Frederick, Elector of Saxony, who was the son and nephew of Luther's protectors, John, Elector of Saxony and Frederick III, Elector of Saxony. Katharina immediately took on the task of administering and managing the vast holdings of the monastery, breeding and selling cattle, and running a brewery in order to provide for their family and the steady stream of students who boarded with them and visitors seeking audiences with her husband. In times of widespread illness, Katharina operated a hospital on site, ministering to the sick alongside other nurses. Luther called her the "boss of Zulsdorf," after the name of the farm they owned, and the "morning star of Wittenberg" for her habit of rising at 4 a.m. to take care of her various responsibilities. In addition to her busy life tending to the lands and grounds of the monastery, Katharina bore six children: Hans (7 June 1526 – 27 October 1575), Elizabeth (10 December 1527 – 3 August 1528) who died at eight months, Magdalena (4 May 1529 – 20 September 1542) who died at thirteen years, Martin (9 November 1531 – 4 March 1565), Paul (28 January 1533 – 8 March 1593), and Margarete (17 December 1534 – 1570); in addition she suffered a miscarriage on 1 November 1539. The Luthers also raised four orphan children, including Katharina's nephew, Fabian. 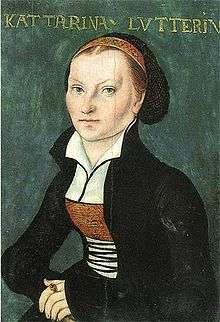 Anecdotal evidence indicates that Katharina von Bora’s role as the wife of a critical member of the Reformation paralleled the marital teachings of Luther and the movement. Katharina depended on Luther such as for his incomes before the estate’s profits increased, thanks to her. She respected him as a higher vessel and called him formally “Sir Doctor” throughout her life. He reciprocated such respect by occasionally consulting her on church matters. She assisted him with running the menial estate duties as he couldn’t complete both these and those to the church and university. Katharina also directed the renovations done to accommodate the size of their operations. When Martin Luther died in 1546, Katharina was left in difficult financial straits without Luther's salary as professor and pastor, even though she owned land, properties, and the Black Cloister. She was counselled by Martin Luther to move out of the old abbey and sell it, after his death, and move into much more modest quarters with the children who remained at home, but she refused. Almost immediately thereafter, Katharina had to leave the Black Cloister (now called Lutherhaus) on her own at the outbreak of the Schmalkaldic War, from which she fled to Magdeburg. After her return the approach of the war forced another flight in 1547, this time to Braunschweig. In July of that year, at the close of the war, she was at last able to return to Wittenberg. After the war the buildings and lands of the monastery had been torn apart and laid waste, the cattle and other farm animals were stolen or killed. If she had sold the land and the buildings, she could have had a good financial situation. As it was, economically, they could not remain there. Katharina was able to support herself thanks to the generosity of John Frederick I, Elector of Saxony and the princes of Anhalt. She remained in Wittenberg in poverty until 1552, when an outbreak of the Black Plague and a harvest failure forced her to leave the city once again. She fled to Torgau where her cart was involved in a bad accident near the city gates, seriously injuring Katharina. She died in Torgau about three months later on December 20, 1552 at the age of fifty-three and was buried at Torgau's Saint Mary's Church, far from her husband's grave in Wittenberg. She is reported to have said on her deathbed, "I will stick to Christ as a burr to cloth." By the time of Katharina's death, the surviving Luther children were adults. After Katharina's death, the Black Cloister was sold back to the university in 1564 by his heirs. Hans studied law and became a court advisor. Martin studied theology, but never had a regular pastoral call. Paul became a physician. He fathered six children and the male line of the Luther family continued through him to John Ernest Luther, ending in 1759. Margareta Luther, born in Wittenberg on December 17, 1534, married into a noble, wealthy Prussian family, to Georg von Kunheim (Wehlau, July 1, 1523 – Mühlhausen, October 18, 1611, the son of Georg von Kunheim (1480–1543) and wife Margarethe, Truchsessin von Wetzhausen (1490–1527)) but died in Mühlhausen in 1570 at the age of thirty-six. Her descendants have continued to modern times, including German President Paul von Hindenburg (1847–1934) and the Counts zu Eulenburg and Princes zu Eulenburg und Hertefeld. She is commemorated in the Calendar of Saints of some Lutheran Churches in the United States on December 20. ↑ "500th Anniversary of Katharina von Bora". Augustana. Retrieved 2014-02-22. ↑ Rines, George Edwin, ed. (1920). "Bora, Katharina von". Encyclopedia Americana. ↑ Rix, Herbert David (1983). Martin Luther: the man and the image. Ardent Media. p. 182. ISBN 978-0-8290-0554-7. Retrieved 12 June 2011. ↑ Gilman, D. C.; Thurston, H. T.; Colby, F. M., eds. (1905). "Bora, Katharina von". New International Encyclopedia (1st ed.). New York: Dodd, Mead. ↑ Peterson, Susan Lynn, Luther's Later Years (1538–1546) . ↑ Karant-Nunn, Susan C., and Merry E. Wiesner. Luther On Women: A Sourcebook. Cambridge, UK: Cambridge University Press, 2003. eBook Collection (EBSCOhost). Web. 3 Dec. 2014. ↑ Treu, Martin. "Katharina von Bora, the Woman at Luther's Side." Lutheran Quarterly; 13.2 (1999): 156–178. ATLA Religion Database with ATLASerials. Web. 3 Dec. 2014. 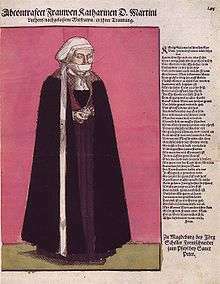 Wikimedia Commons has media related to Katharina von Bora. Wikisource has the text of a 1905 New International Encyclopedia article about Katharina von Bora. This article is partially based on the article Katharina von Bora from the German Wikipedia. ↑ "Internet Archive Search: John Gottlieb Morris".